Like a giant hand reaching out to sea, the port of Balanacan welcomed our boat cramped with weary passengers. The verdant land summoned us to a limestone cove, under tangerine skies and the prayerful arms of the magnificent statue of the Blessed Virgin of Biglang-Awa. After twelve hours of waiting at Lucena and nearly 24 hours after leaving Makati, we reached our destination. We stepped foot on Marinduque. At last. Initially, the plan seemed fairly simple: four lomoheads, four days, six towns, equals one backpacking island adventure. But the Holy Week exodus and unpredictable boat schedules proved daunting. Traveling to this island province during this peak season can drive one nuts, but Marinduque greatly rewards your penitencia with one-of-a-kind religious revelry, beautiful landscapes and gracious people. Although Marinduque is situated between Mindoro and the Bondoc peninsula, one can barely see neighboring land, hence the island’s name suitably drawn from the phrase “mare unduque” or “sea everywhere.” From its taciturn summer waters of bountiful catch and forgotten shipwrecks, the heart-shaped island rises from clean stretches of beaches—the finest of which is Poctoy White Beach along Torrijos—to terraced farmlands, sulfuric springs, mystical caves, hidden waterfalls and all the way up to Mt. Malindig’s cloaked summit. Circling the rugged interior, the six coastal towns—Mogpog, Boac, Gasan, Buenavista, Torrijos and Sta. Cruz—preserve their colonial charm with narrow streets flanked by capiz-windowed ancestral homes, fortified churches, bustling plazas and markets filled with the lilting voices of the Marinduqueño tongue: an accented Tagalog blended with some Bikolano and Visayan. For most of the year, Marinduqueños are engaged in agriculture, fishing, handicrafts and butterfly farming. At Sta. Cruz, organic farms harvest arrowroot tubers used to make uraro cookies, the popular “melt-in-your-mouth” pasalubong. Moreover, the province contributes 85% of our country’s butterfly and pupa exports rightfully making it the butterfly capital of the Philippines. Check out WHS Butterfly Farm (entrance: P20) along the main road at Brgy. Pangi, Gasan. Every year, this otherwise sleepy locale is equated to one festive legacy: the Moryonan or Moriones Festival. During the Holy Week, towns wake up from their cocoon-like somnolence to locals who dress up as gnarly centurions with wooden masks, axes, spears, festoons and multi-colored whatnots. They roam the towns in mischievous merriment, playing tricks and teasing frightened children. Celebrated in honor of St. Longinus, the Roman soldier whose blindness was cured by Jesus’ blood, the festival traces its roots to early 19th century Mogpog, where a parish priest started the first pugutan, a dramatization of Longinus’ miracle, conversion and imminent demise. 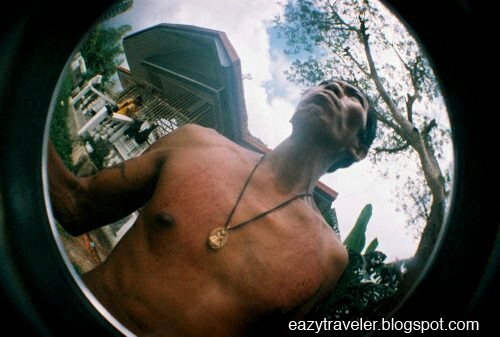 At the old cemetery of Gasan, one can witness the bloody rituals of the antipos (flagellants) who cut and whip themselves on Good Friday as penance and thanksgiving. (A word of caution for the lomographically brave: avoid going too close to your subjects to avoid unwanted hematic spatters.) Bruce, an antipo of 11 years (pictured above), was kind enough to share his commitment to tradition with farewell gifts of holy oil, which he poured into our empty film canisters. “Use this for good not evil,” he instructed, and sent us off with more advice against witchcraft or kulam. The fusion of Christianity and superstition that characterize local spirituality is also observed in tawak drinking at Guingona Park, where men take a potent infusion of anisado gin, herbs, roots, spices and whispered prayers that protect a drinker of seven years from snake bites, dog bites and other maladies. (Drink at your own risk. And brace yourself for a strong peppery hit.) Of course, classic Filipino Lenten traditions are also practiced throughout the settlements—like the cenakulo, salubong (both religious dramas) and via crucis (Way of the Cross). When it comes to religious theater, the capital of Boac stages the grandest, along the length of the river dike with simulated earthquakes, choreographed lighting, and a motorized Resurrection. A shrouded beauty, Marinduque promises far more than the mainstay mayhem of Moriones. From sunken ships to soaring summits. And everything in between… Is it the sway of coconuts fringing its shores? The chant of the evening pabasa? The chorus of crickets that lulls one to sleep on the beach under Orion’s light? Or the fidgety crabs that hasten you to rise and witness the dawn after? Something magical permeates this parcel of earth enveloped by sea. Something that beckons one to return the instant one thinks of leaving. To unravel another vista, another voice, another vicissitude. Backpacking to the heartland of the Philippines may be an arduous journey, but I assure you, it’s ultimately all in the name of love. Tough, tough love. For Sta.Cruz and Torrijos bound passengers they may choose Buyabod Pier. It is also possible to bring your cars, vans, trucks and buses to Marinduque through the roll-on, roll-off ferries servicing the same sea route. (Tip: vehiches are loaded on first come-first serve basis, also bring xerox copy of OR & CR of vehicle). From Balanacan Port. air-con FX, vans and regular passenger jeepneys and tricycles take you to your local hotel or residence. From Buyabod Pier, tricycles and jeepneys take you to Sta.Cruz poblacion where air-con vans and regular jeepney are available for Torrijos- bound passengers. JAC Liner plies the Manila – Marinduque – Manila Direct Route daily. Call (02) 404-2073 for schedule, reservation and booking. Notes: (1) During peak seasons (i.e. Holy Week and Christmas), taking your private vehicle to the island (and back) will be challenging. (2) At the piers, prepare yourself for unmanageable crowds, very long queues and waiting hours. Keep your cool, and kill time by reading a novel or exploring Lucena city. (3) At the Balanacan port, you can purchase discounted bus tickets (around P40 off) for Lucena-Manila. The beaches on the western coast are stony, but this resort offers a great view of Tres Reyes islands, especially during sunset. Great German sausages, too! Jocelyn Schroetter, the owner, rents out vans to explore the island (P2,500/day) and can prepare delicious packed food (P180/head) as well. On our trip, we had grilled squid with tomatoes, buttered prawns and pinakbet (vegetable dish). Nearby points of interest are Gasan town, Tres Reyes islands, butterfly farms, Malbog sulphuric spring (in Buenavista) and Mt. Malindig. We stayed in a family fan-room for five (P1,500). Highly recommended. This secluded homestay with its own white beach cove (pictured above) was the highlight of our trip. A piece of heaven on earth. Tucked a short walk away north of Poctoy White Beach (entrance: P10), Hanspeter’s haven only has two twin rooms (P700 each), with shared refrigerator and outdoor cooking area. No restaurant here. We had our meals at White Beach: a freshly cooked dinner for five costs only P250. At night, you can buy beer and chips at White Beach, and have a candle-lit picnic under the stars back at “your cove.” We slept at the beach. Dawning sunlight filtering through the mangrove perched on the jagged limestone border was simply beautiful. Besides White Beach, other points of interest are Torrijos town and Battle of Pulang Lupa Marker. The town’s oldest inn, this freshly-painted place built in the 1960s is perfectly located in the heart of Boac, between the Boac Cathedral and Moriones Park. Beautiful 19th century houses line its neighboring streets. (See location in Boac street map.) Other spots are the National Museum and Kusina sa Plaza for Marinduqueño food like adobong manok sa gata. Boac is 20-minutes south of Mogpog town, birthplace of the Moriones festival. We stayed in a double air-con room, good for four (P950). i always dream to go Cebu island! he told me there’s paradise! waaaahhh! you have fisheye and super sampler pala! borrow! really nice shots ed! love the first one and the one with the moriones mask! wish i could go with you next time! @punky: Sure! Yeah hope we can push through with our photo trip soon. 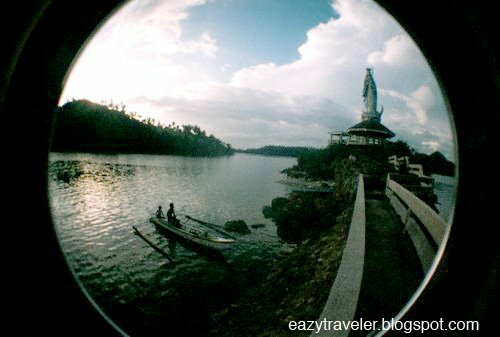 Maybe the best blog I’ve read on Marinduque so far. Good job. We had too many things in our summer schedule so were in Marinduque only for Holy Thursday and Good Friday, left noon time of Black Saturday. Had i come across your blog earlier, we might have had a different schedule. Thanks Andrea! I want to visit Marinduque again soon as well for some trekking and to visit some caves and outlying islands. I’m glad to hear that my blog enlightened you. Happy, happy Easter! good thing naligaw ako dito.. haha.. salamat dito sir edgar. this is nice..inspiring! its always been great to be a traveler i should say..! anyway,. my friends and I are planning to visit #Vigan this december..can i like ask some tips here or any recommendation you can offer in going there? thanks! You really inspired me to pursue my dream as a travel agent. God bless! day 159/165 happy thoughts: Live your dreams like you want it to be.